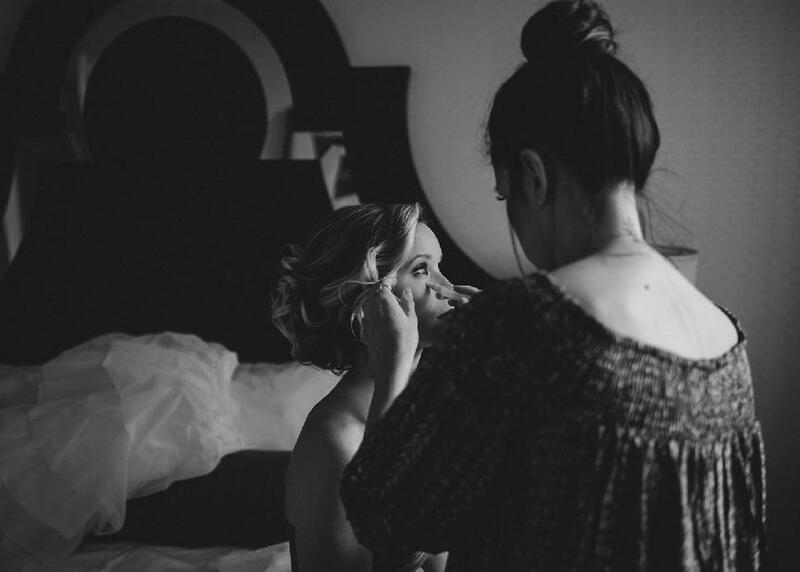 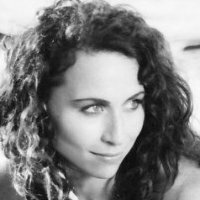 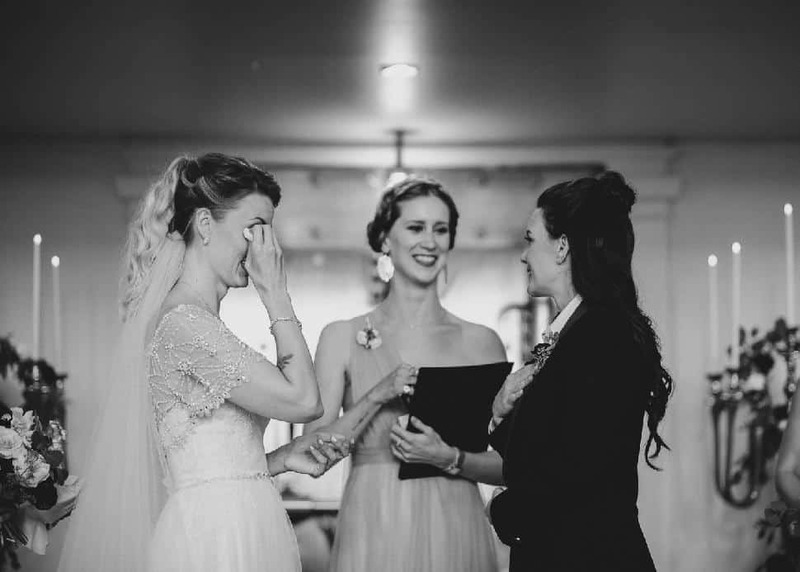 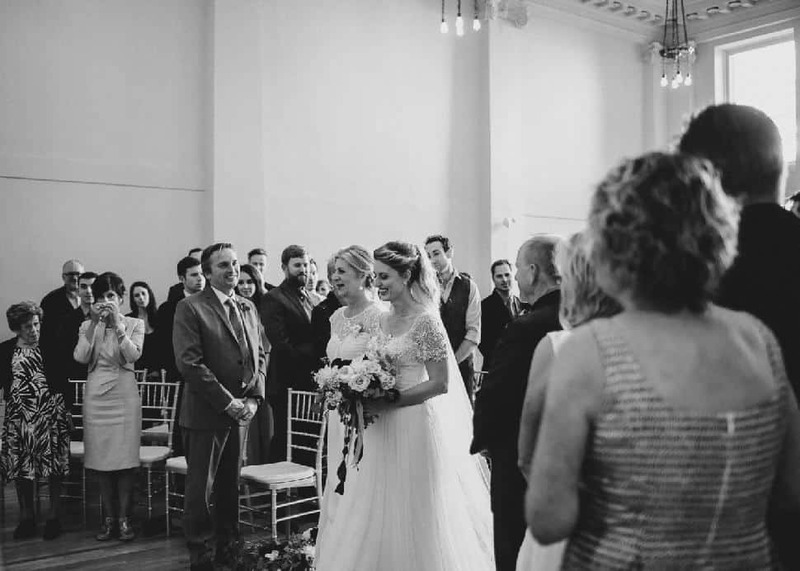 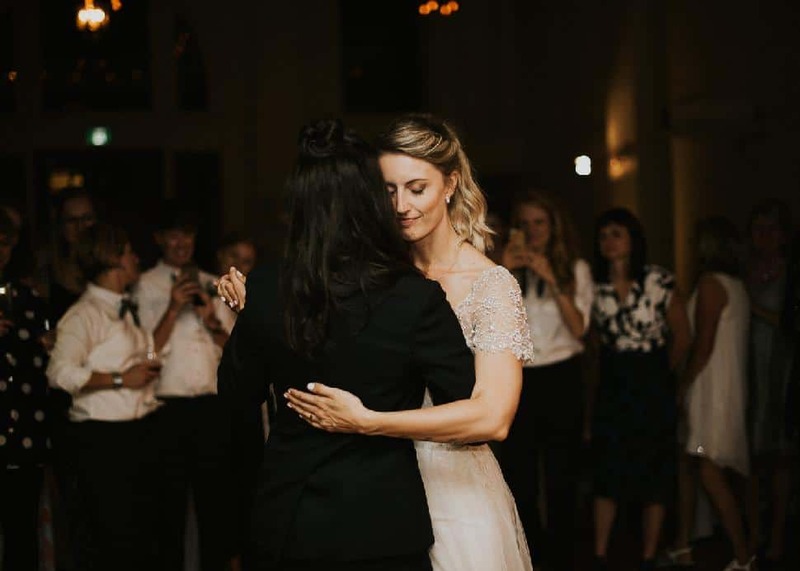 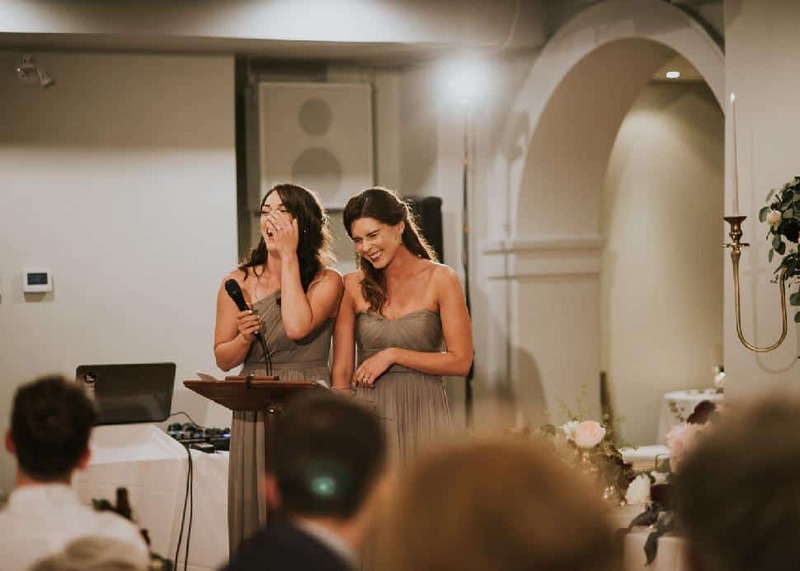 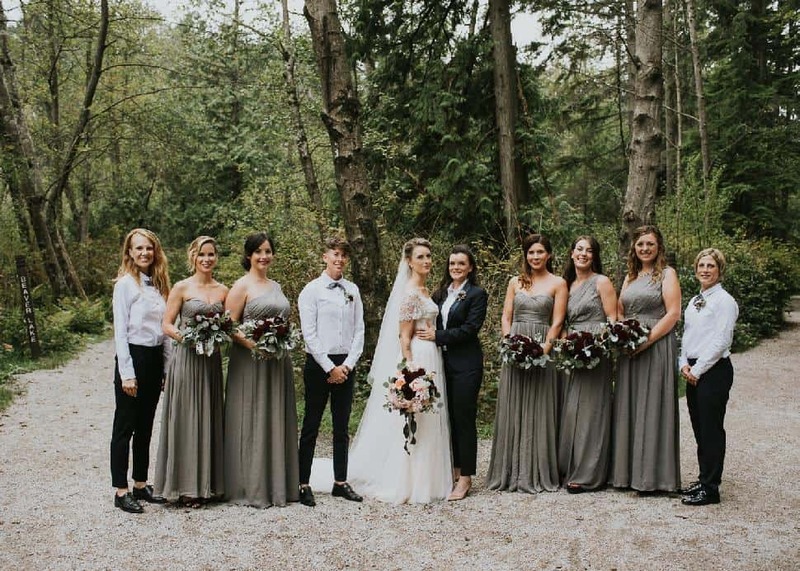 Wanting every member of their wedding party to retain—and celebrate—her individuality, Elle and Sarah encouraged each of their eight closest friends and relatives to wear either a floor-length grey J.Crew gown with a choice of several necklines, or slacks, a Peau De Loup button-up shirt and a French knot bow tie. 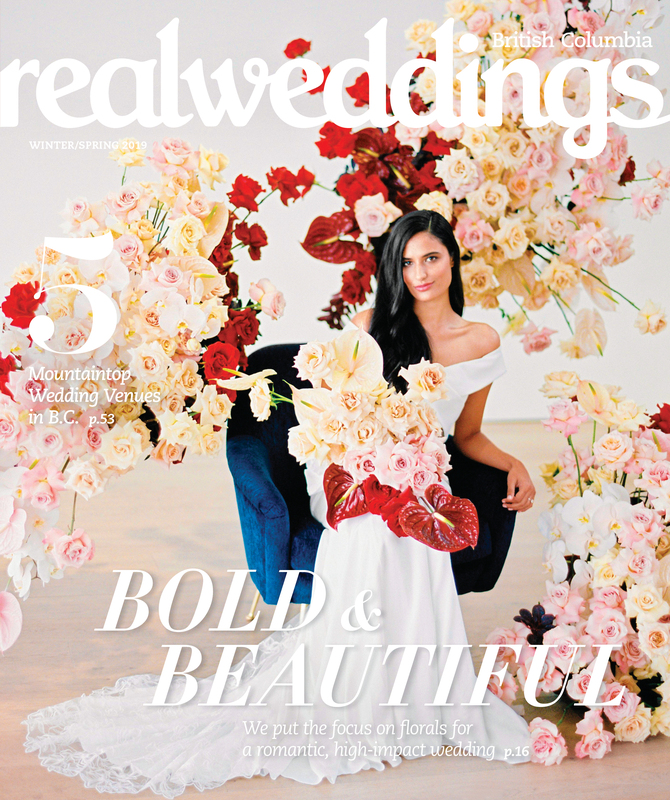 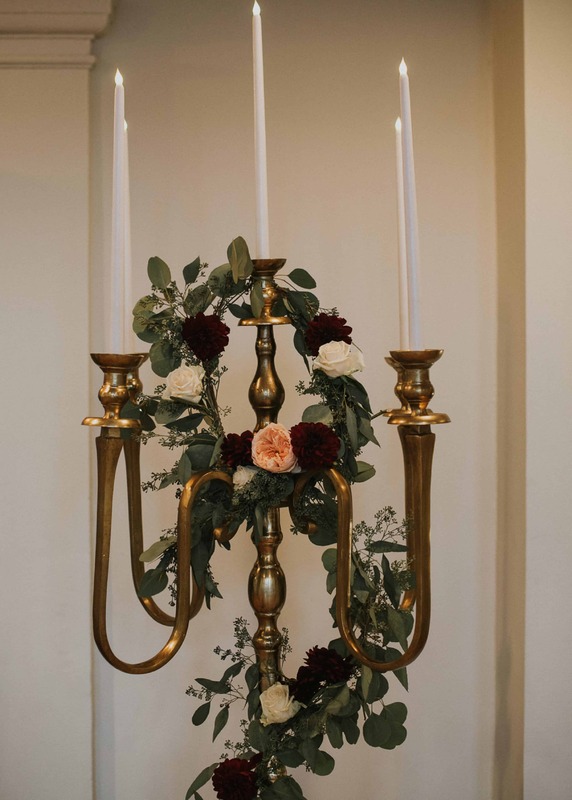 Though the more complex pieces—the bridal party’s bouquets, for instance, plus two ceremonial candelabras—were created by the pros at Quince Fine Florals, the remaining arrangements were completely DIY-ed by Sarah and Elle, with blooms (and hoards of eucalyptus) obtained from The Latest Event. 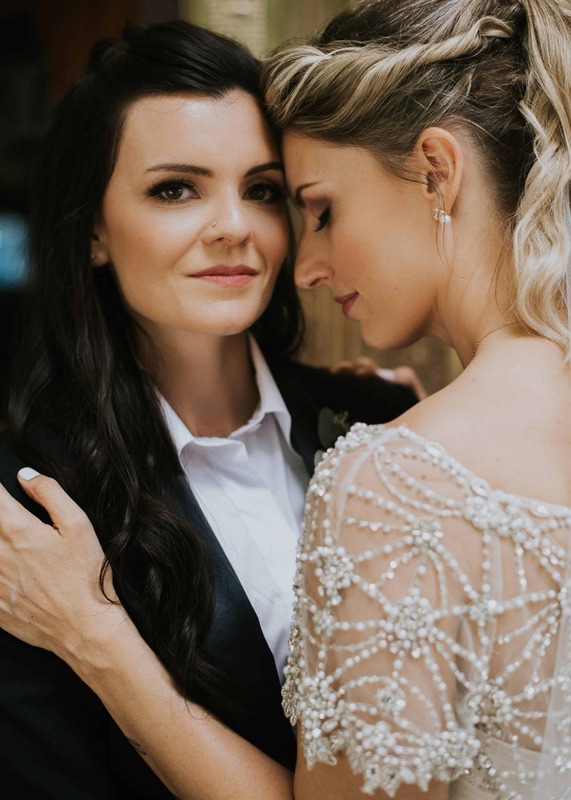 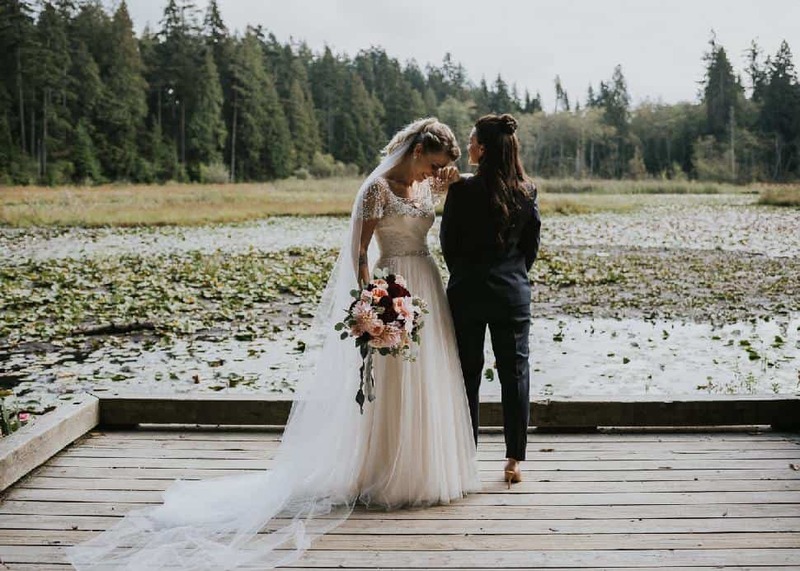 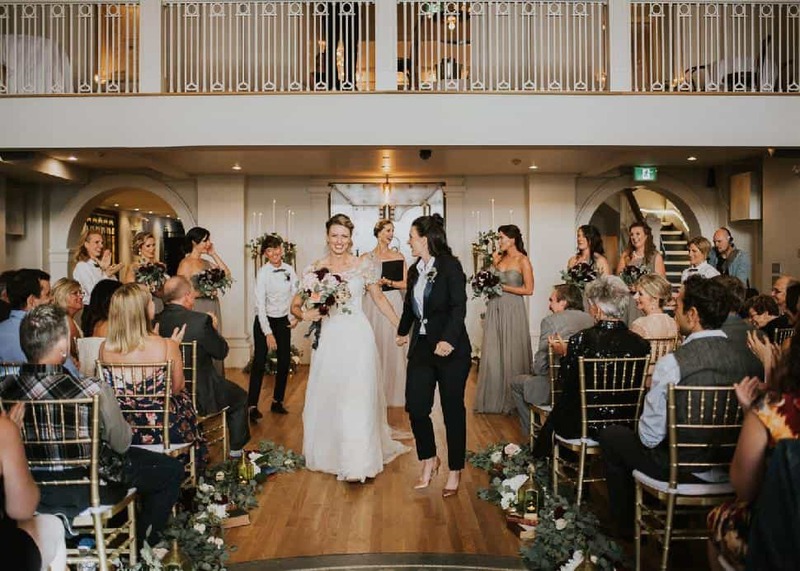 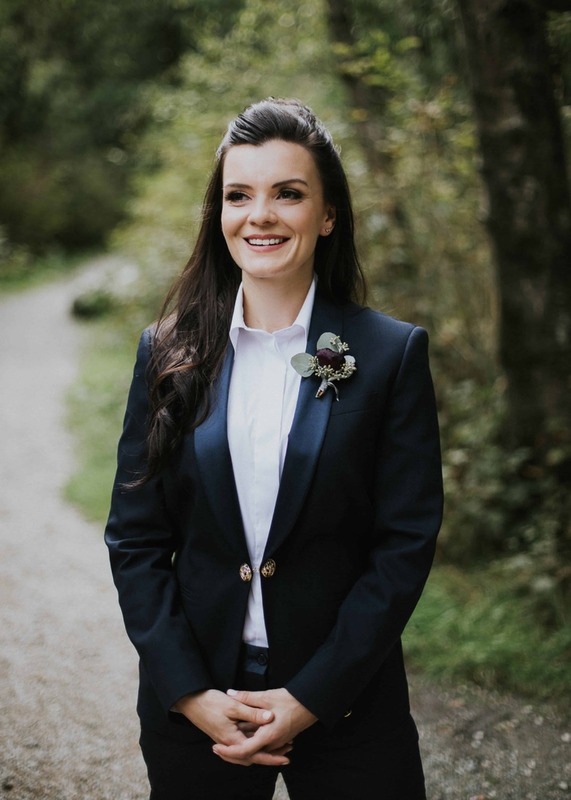 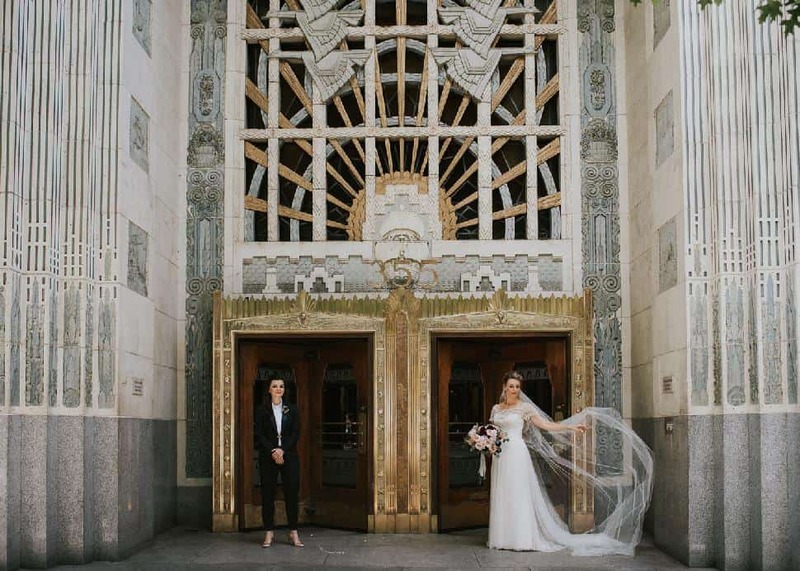 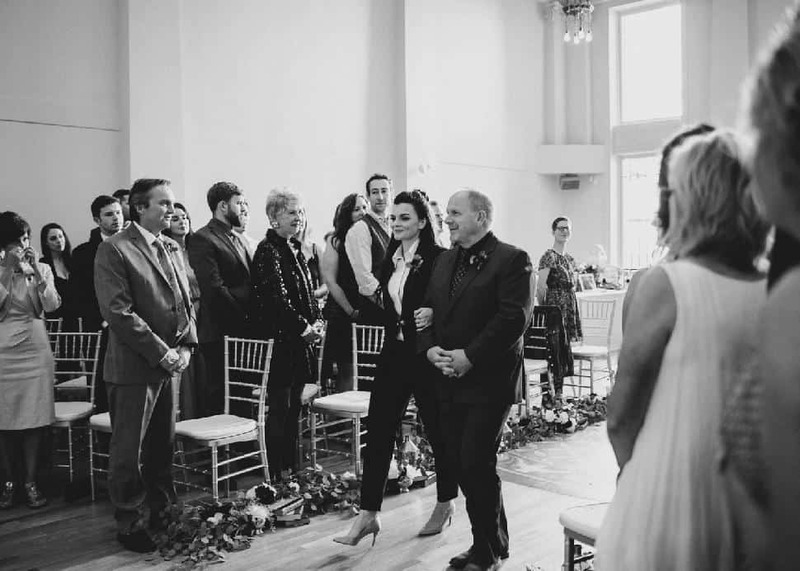 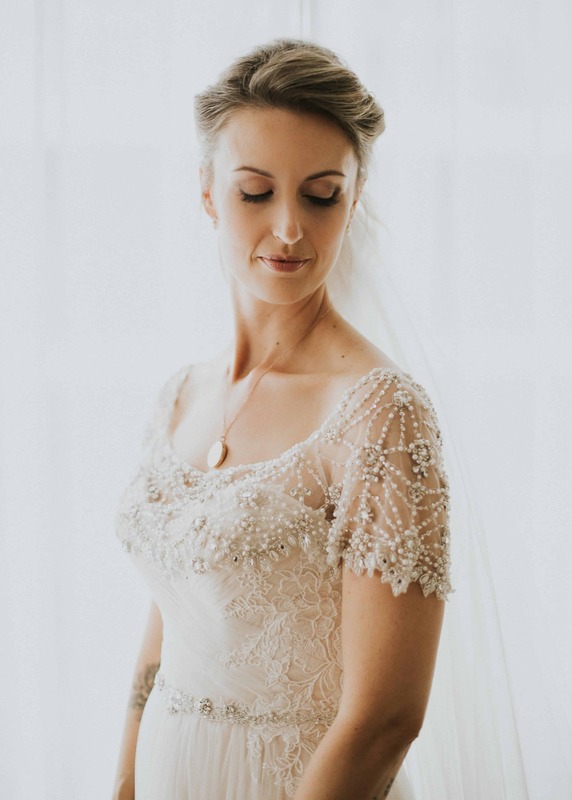 Elle matched her Bridal Gallery-obtained Maggie Sottero “Patience” gown with a second-hand capelet while Sarah paired her custom suit from clothing designer Blair Shapera with rose-gold Calvin Klein pumps. 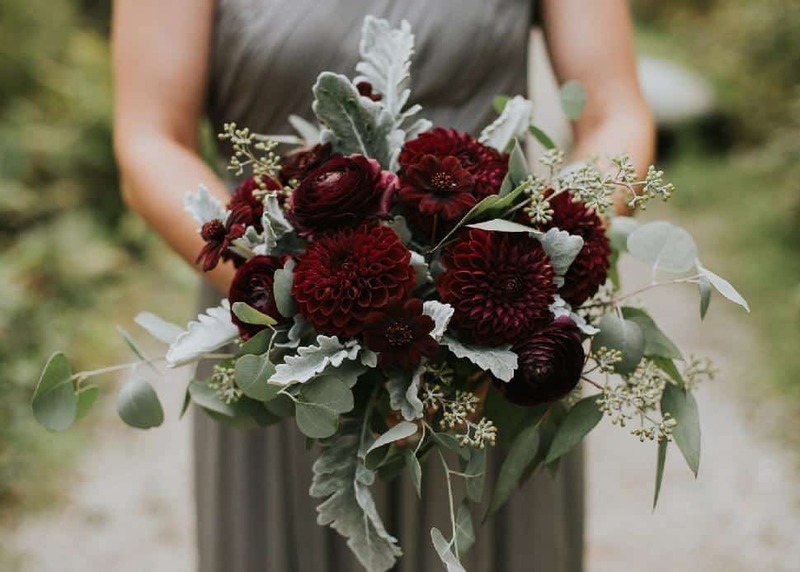 Elle’s bouquet, by Quince, was bursting with Cafe au Lait dahlias, Juliet roses, red scabiosas and—Sarah’s favourite—eucalyptus. 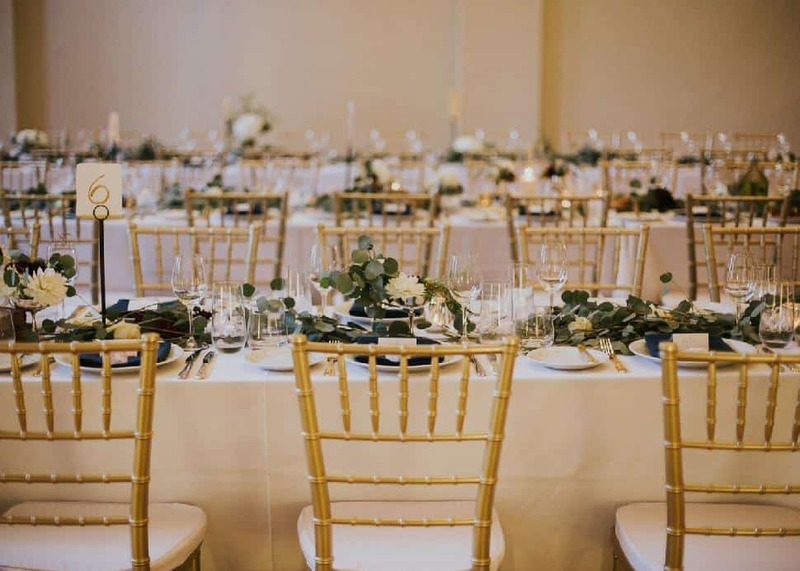 Elle learned calligraphy and wrote all of the signage, place cards and table runners for the day by hand—no small undertaking, but it added a wonderful personal touch. 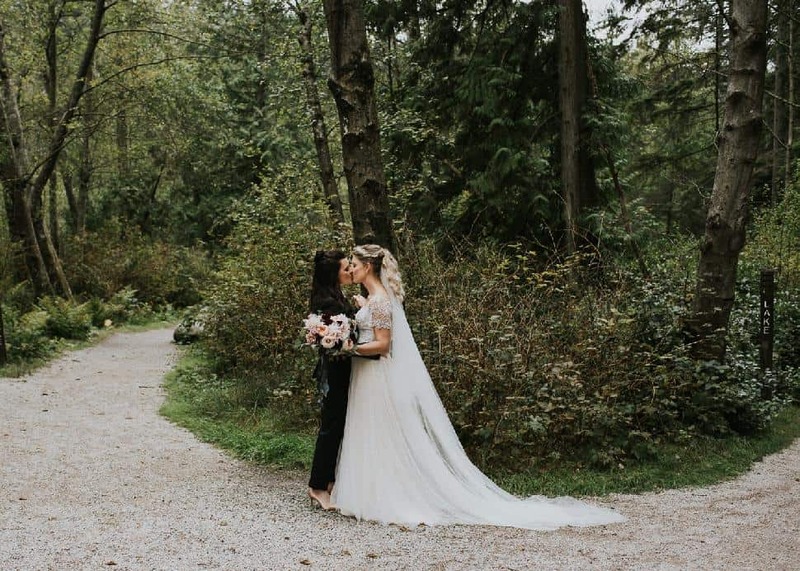 Sarah and Elle’s officiant cleared the space by burning Palo Santo before the ceremony, and each and every guest performed an individual blessing on the rings. 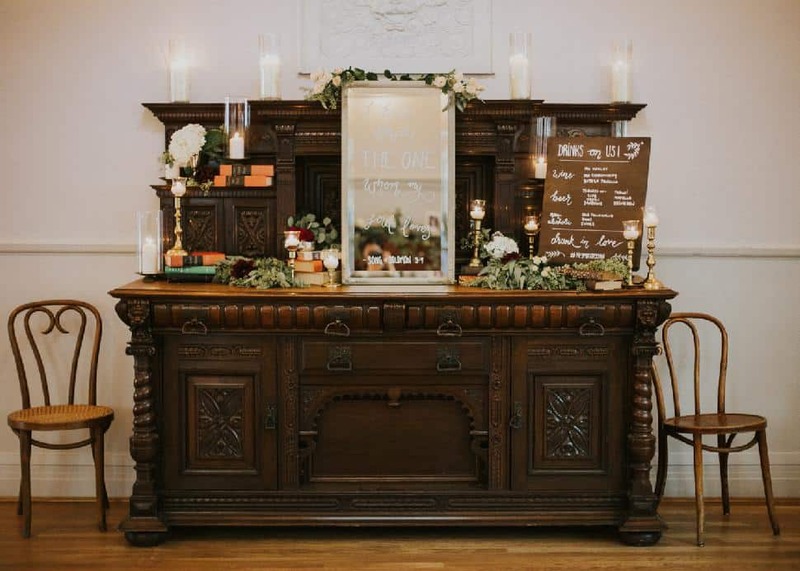 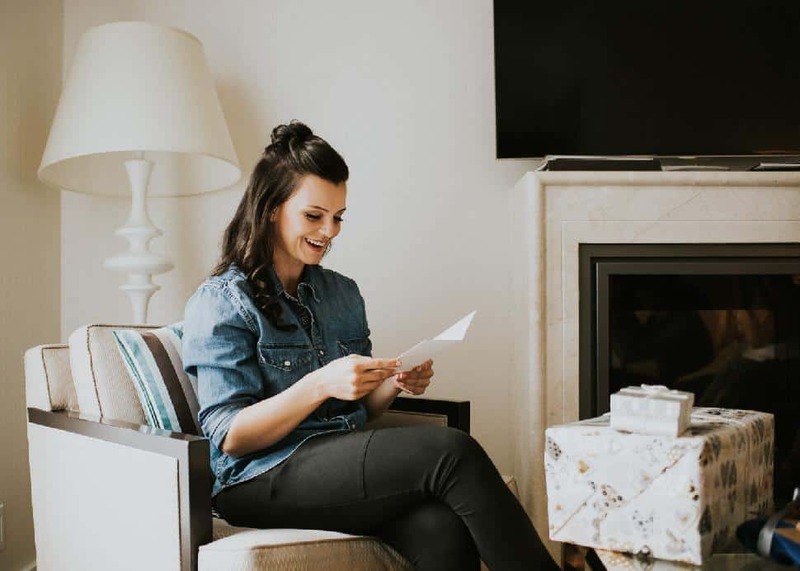 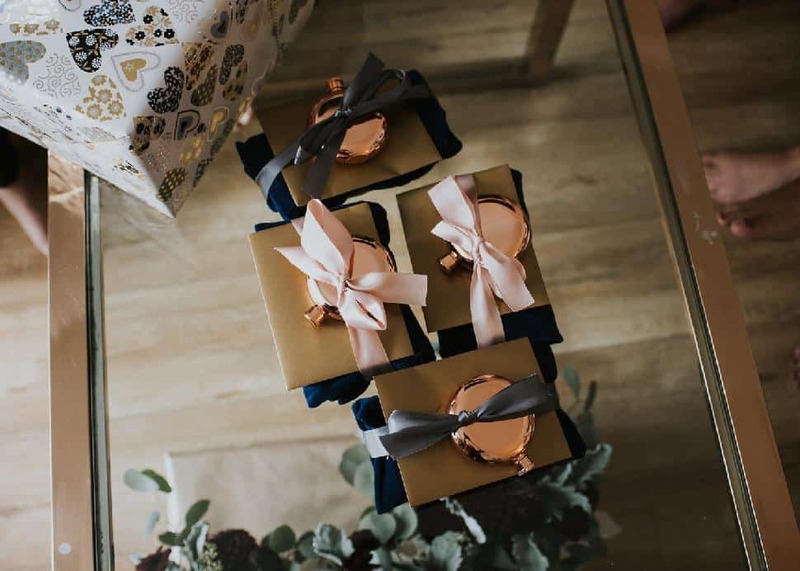 Today, when the brides light the same candles that were set on each table during their reception, it brings back sweet tobacco flower, patchouli, orange, clove and cedar-scented memories of their big day. 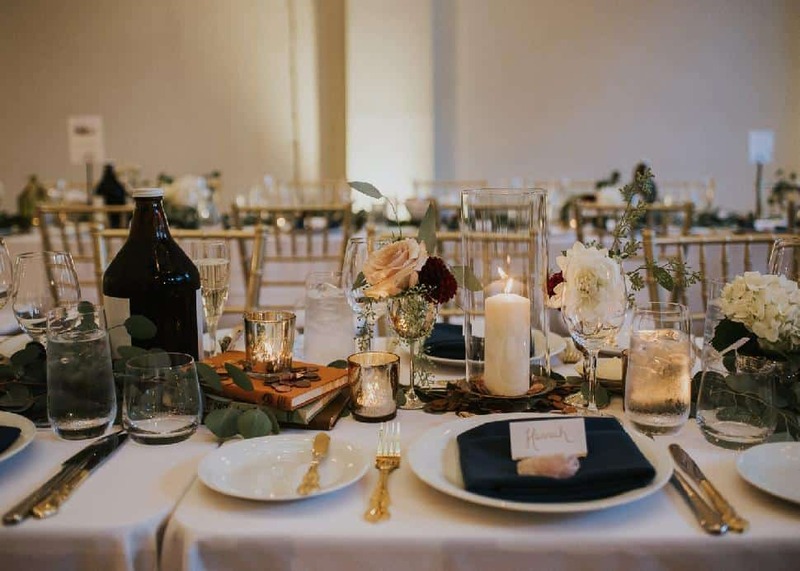 Foregoing a cake, the couple had a close friend (and talented baker) create individual apple pies in mini mason jars for all to enjoy. 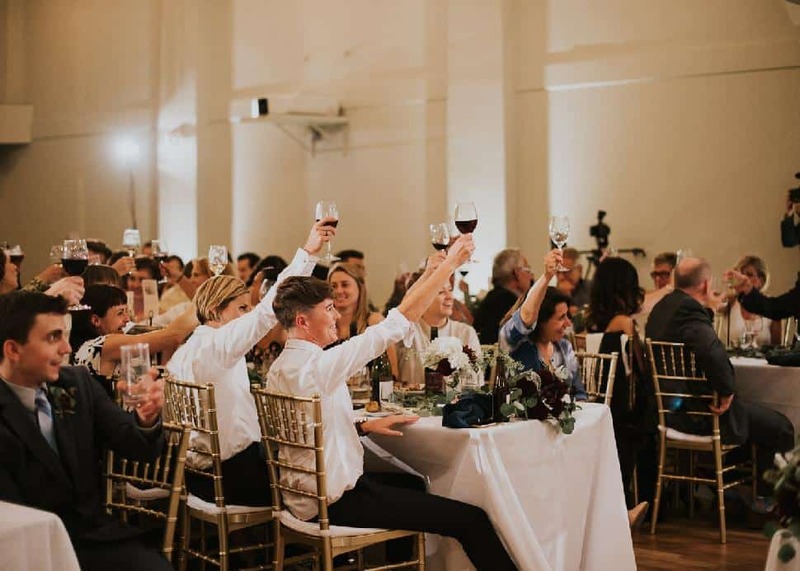 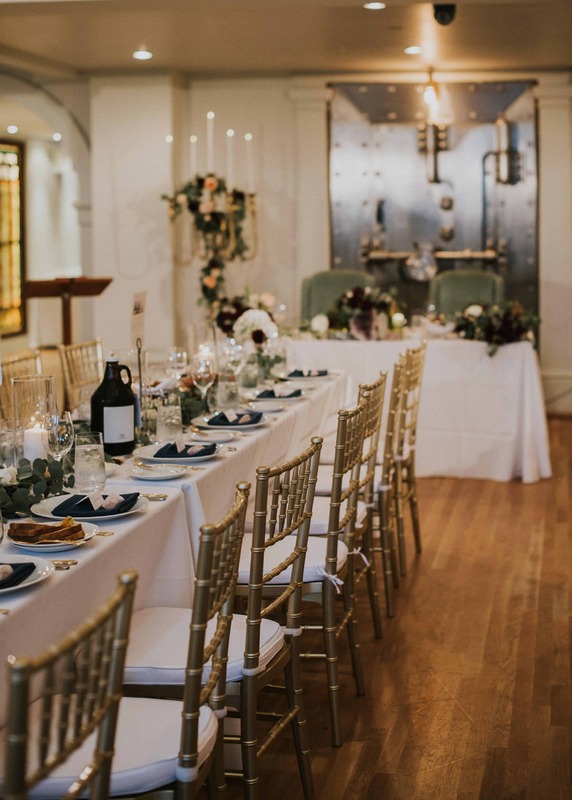 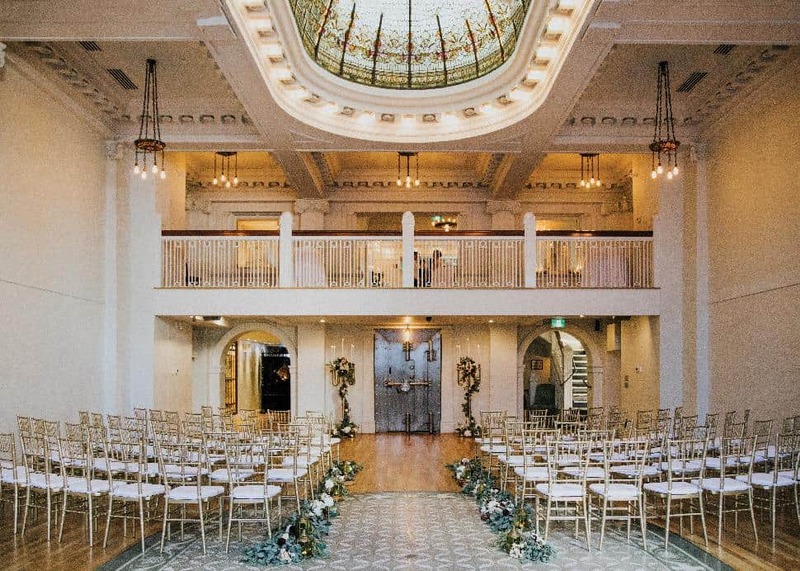 A lion’s share of the furnishings, like the gold Chiavari chairs that were repurposed from ceremony to reception, were part of The Permanent’s own collection. 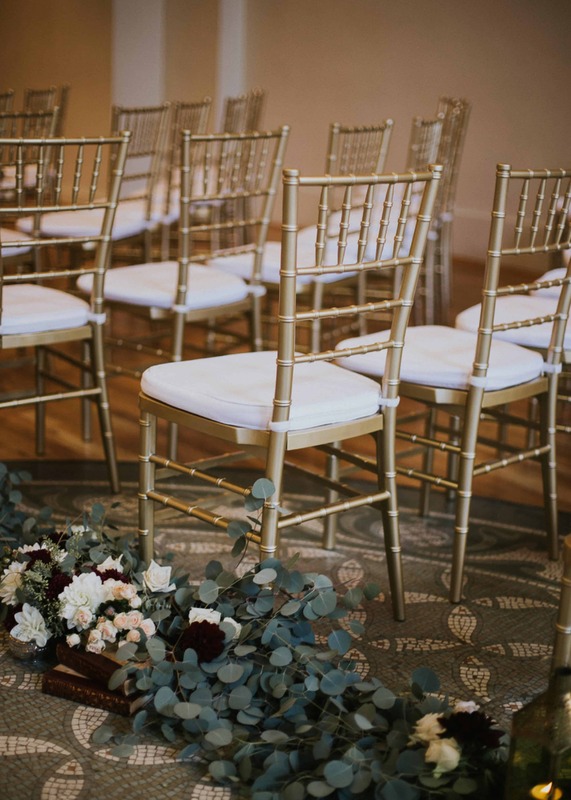 Spruce Rentals and Koncept Event Design provided other key pieces, including two dusty green high-backed velvet chairs for the sweetheart table. 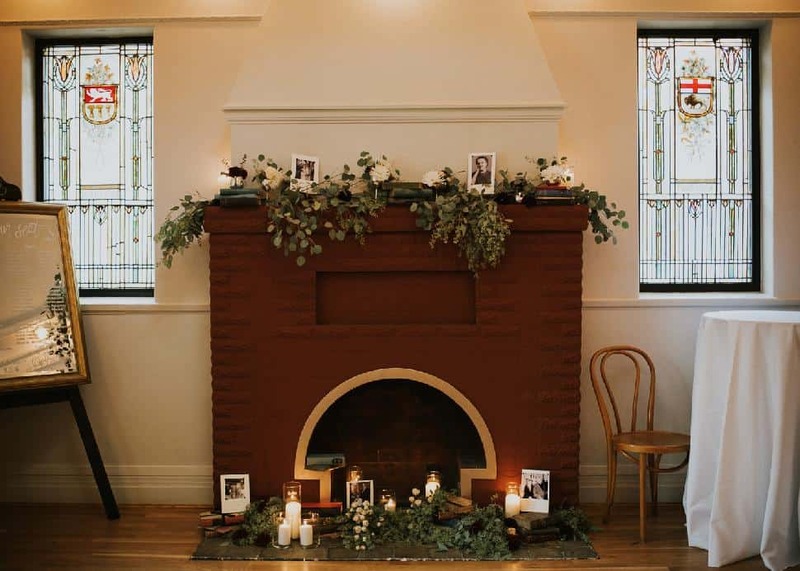 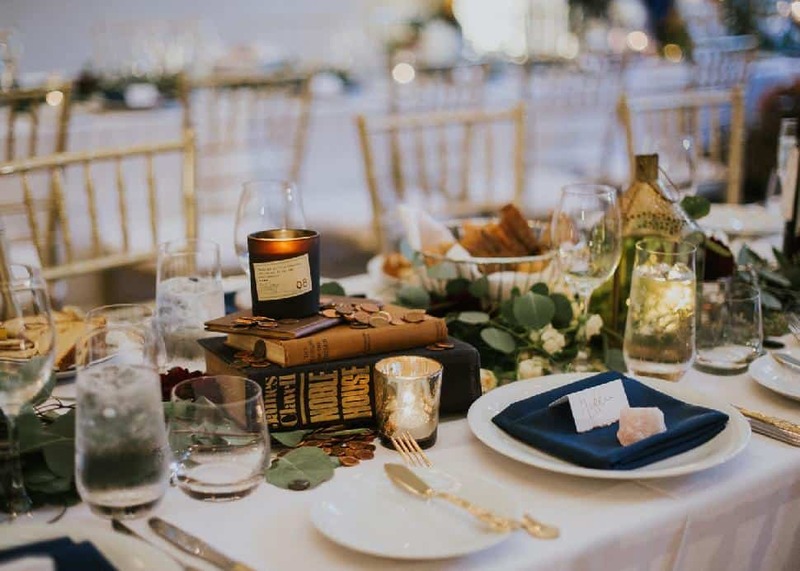 The centrepieces—tangles of eucalyptus leaves, candles and more than 200 vintage books procured from Craigslist and online wedding boards—were kept low so guests could converse. 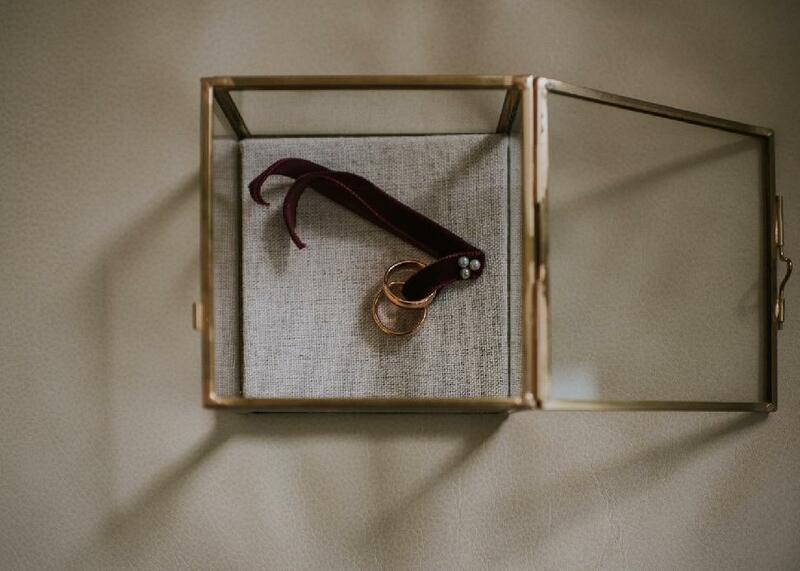 Pieces of rose quartz symbolized compassionate love. 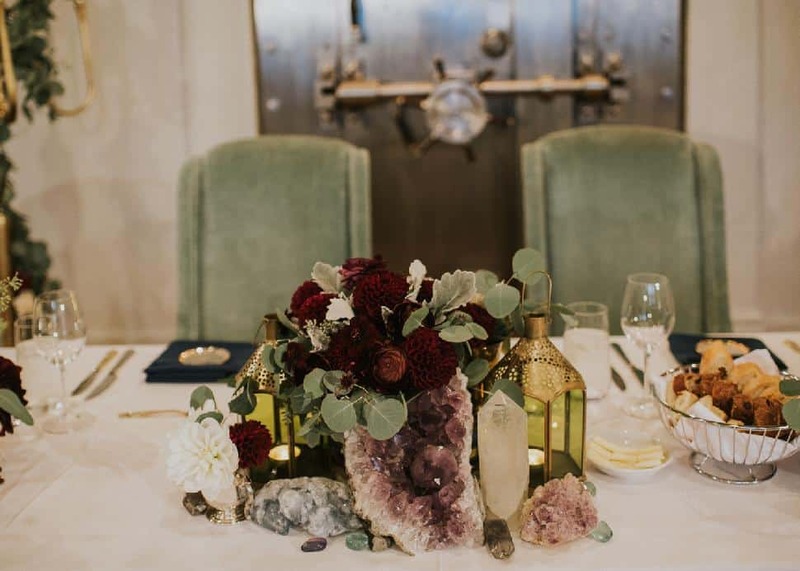 Pennies, donated by family, friends, colleagues and acquaintances, were scattered throughout the table settings to pay homage to the former life of the venue and for good luck.